Why was the BFHS started? The Bakersfield Fire Department is over 140 years old. It is filled with rich history, historic apparatus, and timeless artifacts. 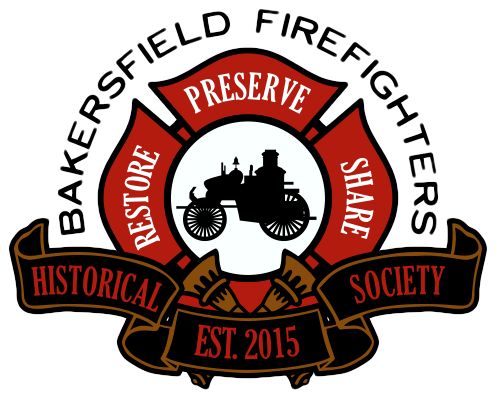 The BFHS was started to have an organization dedicated to restoring, preserving and sharing the Bakersfield Fire Departments historic apparatus, artifacts, and history with the public. What is the mission of the BFHS? The mission of the BFHS is to restore, preserve and share the valuable history and timeless artifacts of the Bakersfield Fire Department. Yes. The BFHS is a registered 501(c)(3) non-profit organization EIN 47-3099227. We are also registered as a charity under the California Attorney General’s Office of Charities #CT0217058. Are memberships open to the public? Yes. Our memberships are open to anyone who is interested in helping restore, preserve, and share the valuable history and timeless artifacts of the Bakersfield Fire Department. Why are there different levels of memberships? The BFHS wanted to give different options to anyone interested in helping our mission. We wanted people to be able to choose the level of support with which they are comfortable. Are there benefits to the different levels of memberships? Because the BFHS is still new, there are no extra benefits to the different levels of memberships at this time. As our organization grows, we will start to introduce different benefits to the membership levels. An example of this will be discounted tickets and special privileges at our fundraising events. All memberships are still tax deductible. What do my contributions go towards? What are the short term goals of the BFHS? Our first short term goal is to restore our newly acquired 1976 American La France fire engine. This apparatus is in need of new paint, diamond plate polishing, new gauges, new tires and other miscellaneous items. After the restoration of the 1976 engine, we will be starting the restoration of our 1905 horse drawn ladder truck. Both of these projects will require significant money for us to restore them correctly and preserve them for years to come. Where are the apparatus kept? As of now, the apparatus are stored at several fire stations and storage facilities. The long term goal of the BFHS is to acquire a building that is big enough for us to store all of our apparatus and artifacts. We would like to turn this building into a museum for the public and schools to visit.